Is it wise to go for a boat trip in Phuket when the sky is overcast and the day drizzles? 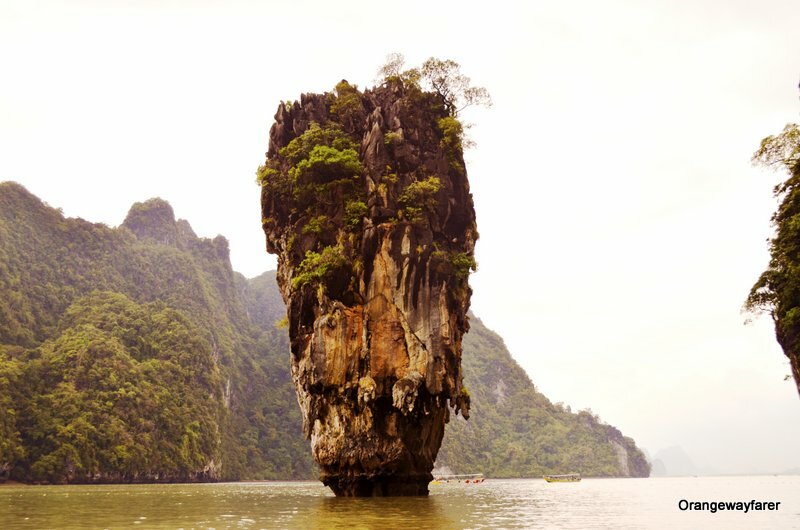 Not every day starts with a plan to visit famed James Bond island or the Phang Nga archipelago, but when it did for us, Phuket sky decided to remain outcast. If you are staying at Pattaya, and have booked a trip the night ahead with local tours and swear by being able to wake up early morning, you might be taking a wrong decision, given Pattaya is such a heady cocktail of a beach town. Especially if you are planning the Phang Nga Bay tours on a day with shower on a forecast. 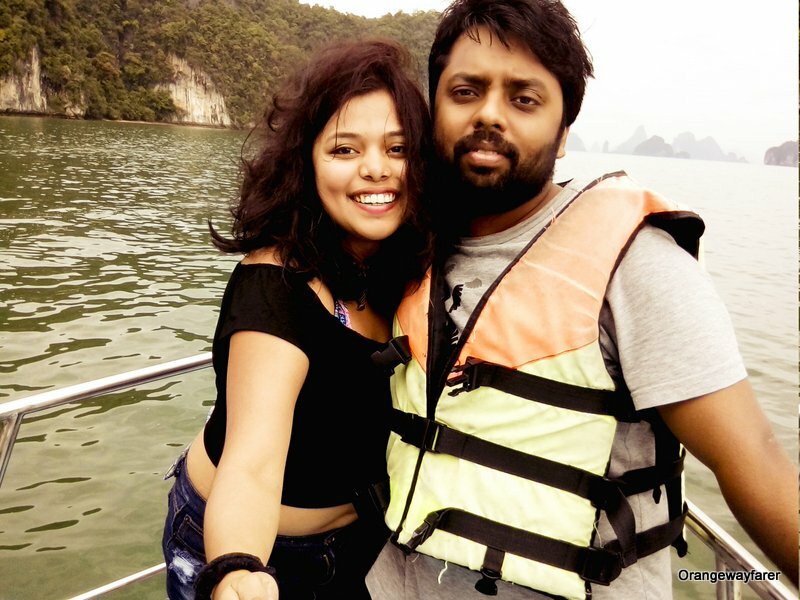 Also read, A day trip to Paradise on earth, Phi Phi Island! We were picked up by a minivan early at 8 am. They took us to the boat. Pier is pretty decked up with tiny touristy shacks selling colourful hats. Boy, do they overcharge! But I got my bikini at a pretty good price (300 Baht). 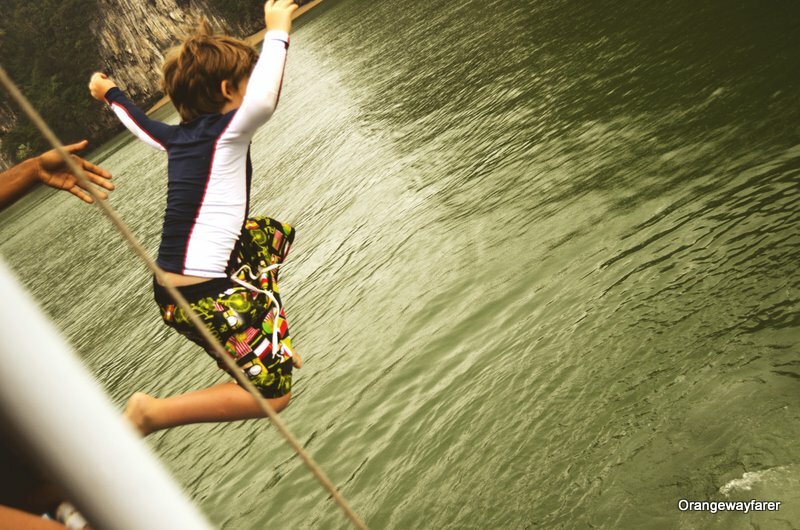 A Turkish boy jumps from the boat. His father was awaiting him in the water! Diving is fun but I learnt it can be painful as well! We waited for a good 15 minutes till everyone arrived. You can also take this trip in case you are put at Krabi. 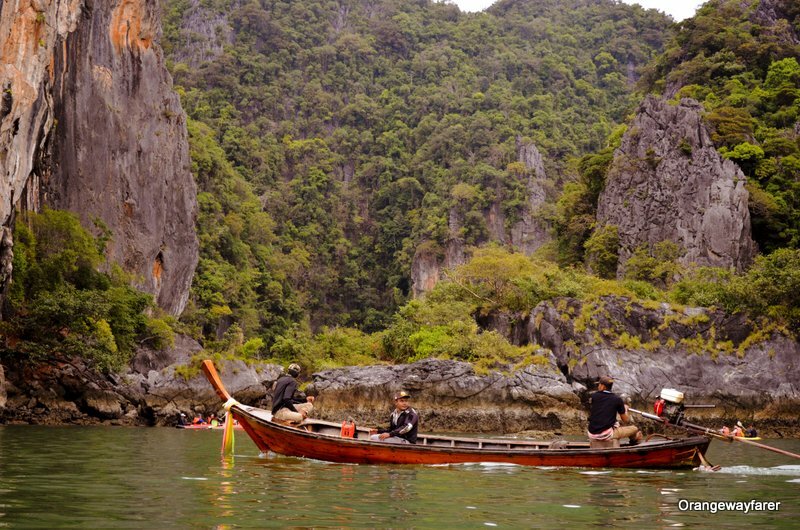 Frequent Krabi to Phang Nga bay boat trips is arranged by locals. The good part is you get to avoid the maddening crowd of Phuket! 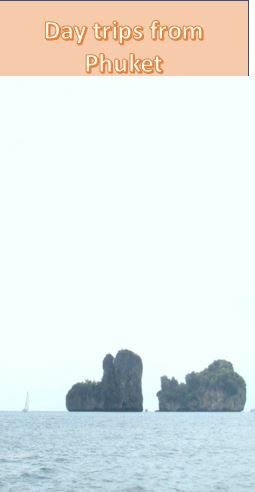 The Famed James Bond Island! The upturned limestone is the unique feature from the Bond movie The Man with the Golden Gun! Heading towards Khao Phin Kan (the local name of the James Bond Island)! The boat set sail around 9:30 in the morning. Andaman sea is dotted with tiny cruises, a new venture by the Thai Government where they will cruise the travellers for 3 weeks or so. 3 weeks of the sea is a bit too much in my opinion though, keeping in mind SE Asian countries offer a wide variety of exotic experience, local customs and sumptuous food on the landmass. Love Marks on Limestone Rocks by the Sea! Also read, Day trip to Kuang Si waterfall from Luang Prabang, Laos! The steamer boat was open from every side on the top. A mere shower will drench the boatmen, let alone be a thunderstorm. Yes, that is an experience of a lifetime, the sky and sea merges into one glistening silver line at the horizon, mist surround the limestone cliffs like a docile Poseidon; to have known a sea like that! Coming back to the boat! The Boatman behind us in Ali. ALi knows the sea well. He warned us of a possible whirlwind and that actually took place! 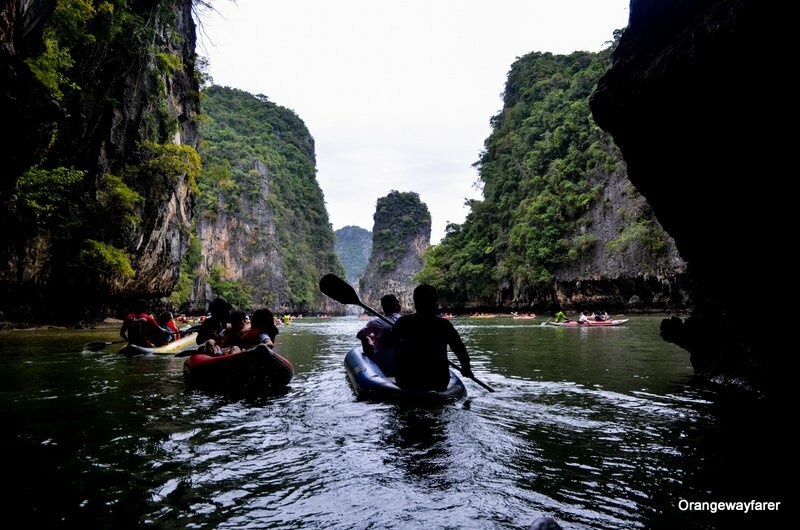 One of the highlight of Phang Nga Bay tours remains Kayaking to the bat cave. 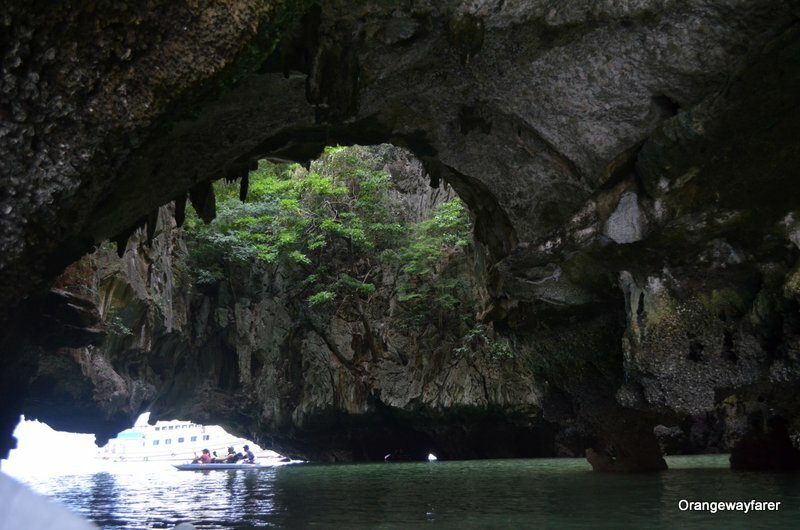 Exploring the marine lives by the limestone monoliths in the Sea cave canoe in Phang Nga bay is an exquisite experience. Ali, our sailor, originally from a province of Krabi was satisfied with a meager tip of 20 Baht. Please don’t expect the same with the rest of the lot. 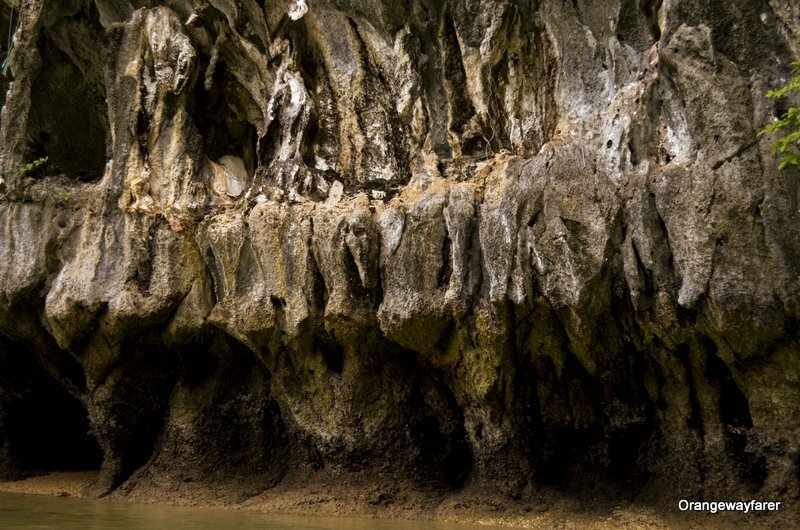 Bat cave has dead mangroves lying on the interiors of a volcano lookalike ancient cave. A perfect place to film a pirate kingdom in my opinion. They will make you walk inside the cave through a narrow opening, walled with a glittering ribbon of diamonds. If you have the luxury to travel by your own (not a group tour) , you may consider exploring it for a longer time period, it has lesser footfall, however, be sure to vacate the place before the tide comes in, the blue-green sea water has left its mark on the cave walls. Thai police frequents the area. Piles of tourist-boats come and go since Phang Nga Bay tours is one of the prime attraction of Phuket. Lunch was served with an array of choice. Thais cook chicken with the whole cashew while we Indians prefer to make a paste out of it and mix it in our curry. The fish had a fiery coating of red chilies. Phad thai, since made with home made noodles is considered healthier than the noodles we get in the market, made in refined flour. Phad Thai, may be for its health benefits, never appealed much to me. Also read, the Thai food I have loved the most! 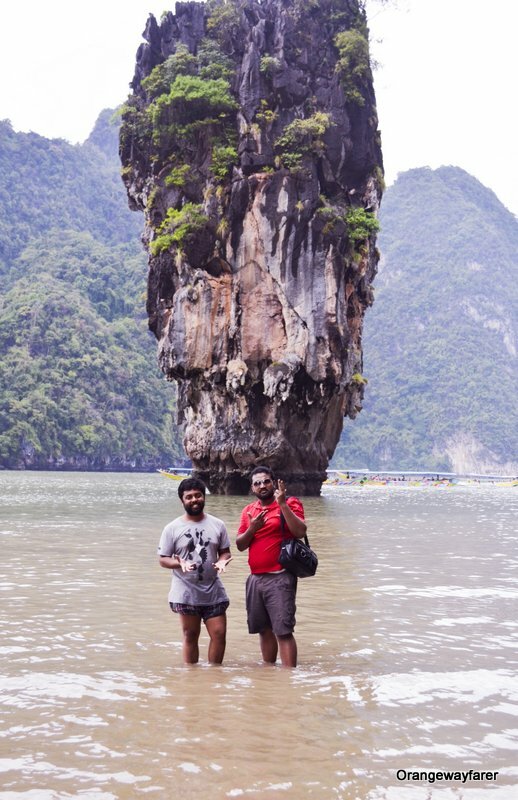 We resumed for the smaller James Bond Island, Koh Phanak. A man in knee deep sea water promptly clicked us in the Kayak. His daily wage is earned through this practice. Not at all matters if it rains, the sea surges, the thunders stuck, while I recall that incident and write, a man with Polaroid is picturing tourists in Marine Park. 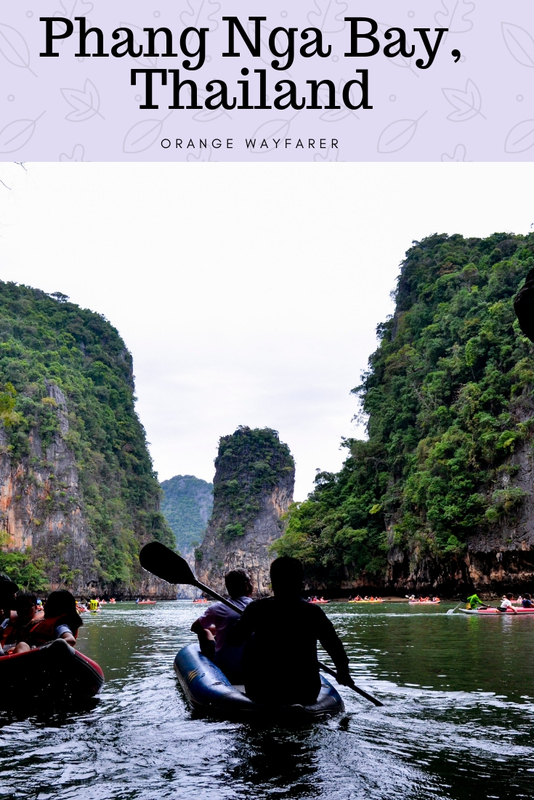 Kayak though the pinnacles of limestone cliffs, with leisure, experience Andaman sea from close, smell the salt, feel a stark difference of the tender touch from the beaches back home. Once the strolls get over and the rain ceases, we were transported to a smaller vessel to experience Koh Tapu, the mighty one famous over the world for “Man with a Golden Gun” stardom. The toppled down cliff is to be experienced from a distance, amidst crowd across the globe and local pearl sellers. May be the crowd or the rain or expectation of a higher stature, Koh Tapu did not cast her spell on me. I must mention the Chinese twin sisters, dolled up in a pretty Barbie dress and clicking selfies there in. We were to visit few beaches, but incessant rain and temporal weather came in the way. The vessel stopped amidst the sea while some of us dived straight into the sea-water and made merry. Temperature goes way beyond the comforting tropical climate zone when it rains and we shivered while wrapping ourselves with the white towel brought from AirBNB. By 5 pm we were back to the pier we started from, the minivan ready to transport us back to Bangla road and adjucent area. 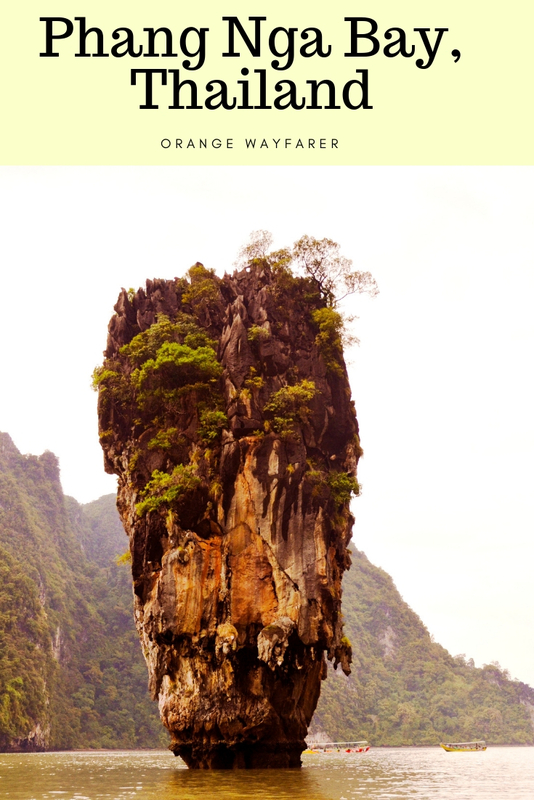 How to get to James Bond Island from Phuket; all that you need to know! Book with a tour and pay no more than 1000 Baht per person for whole day. (Rate as on January,2017). There are plenty of Phang Nga bay tours from Phuket Tickets available from the small shops on he street. Do carry extra clothes, towel, mosquito repellent, swim-suit. Do not step into Mud, I ended up with skin irritation after running after a salamander and losing one side of shoe. Unless there is a tsunami threat, do not consider cancelling the trip with only rain warning. The bay is more beautiful with showers and drizzles. Hotels in Phang Nga bay Thailand is not readily available. Also, you will be left with very few options in the island by night. In case you can manage to find a home-stay with the local villagers and get to experience Thai culture first hand, I suggest to stay here. 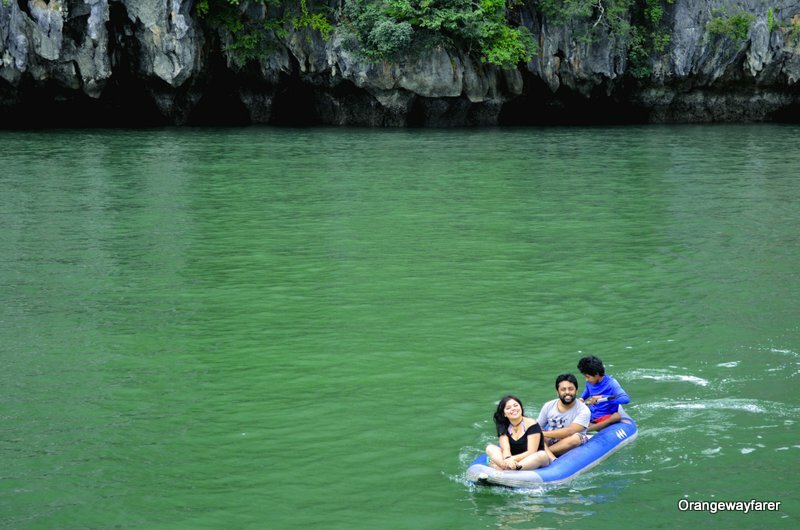 In general, phang nga bay tours are conducted on a half day basis. The evenings are spent by the sea shore town of Pattaya or Krabi. Want to tour Thailand virtually? Look no further but here at the photowalk. Your pics are stunning! I look forward to following along on more of your travels. Slowly working my way through them 🙂 Only wish I had read this before my little sis and her husband went there, you have some great tips to pass along. Good work! What an excursion! And how cool are those mangrove roots in the cave – I’ve never seen that before! I’d love to take this trip when we finally get to Thailand! Honestly, i loved bat caves more than the James Bond Island, less crowded and real smell of earth. Make sure to come out before the tide rises up. I have a video of it will be uploading soon. Thanks a lot! This sounds like a pretty unique experience to have in Thailand! I love how you refer to Poseidon and how you use your vibrant vocabulary! I’m going to Thailand in 2 weeks, but I will only be staying in Bangkok… This story makes me want to visit this place someday as well. 😀 I am so glad I could help you! Do visit Vietnam and Cambodia as well. Vietnam is more exotic in culture. Laos i hear is even more picturesque. Happy travelling! Such a nice read! I definitely spotted the beauty haha I love her sunglasses by the way! You seemed to have so much fun on your trip! Complete FOMO right now!! Beautiful photos! Now I want to book a ticket to Thailand! thank you! Thailand is love! I absolutely loved spending time here! Thailand is such a beautiful country and there are so many great places to visit! Phang Nga was even more beautiful in rain! thank you! We took a day trip there a few years back now. Loved it! Especially the boat trip there, the islands are so beautiful. This brings back so many memories. Sounds like one hell of an adventure! Love the pictures – really is an island paradise ? it sure is an island paradise! These islands are so beautiful! I would love to see them someday. And feel like a spy or a pirate! What a cool experience. If you know swimming you can most definitely do that! How lucky you are! for you got to stay in a country as beautiful as Thailand. soulful write-up and nice pictures. how I long to be there with u ! ur blogs are henceforth must-reads for me. It is a surprise for me that you have taken an effort to be here from facebook page shares! could not have asked for more! Thanks a lot and welcome to orangewayfarer!